Word on the Streep: Shoulda Coulda Wouldas #11: "Mary Stuart"
As early as 1997, several sources reported that Meryl was set to produce and star in a screen version of Friedrich Schiller's play Mary Stuart with her friend Glenn Close. Streep would portray Mary Queen of Scots, the cousin of English Queen Elizabeth I (Close). Not only did Streep and Close ultimately not star in this production, but the film never ended up getting made at all. This is therefore the only Shoulda Coulda Woulda I've posted which covers a project that never made it to the big screen. It also would've been the first film Meryl co-produced (if we don't count her made for TV movie ...First Do No Harm in 1997). So what happened? 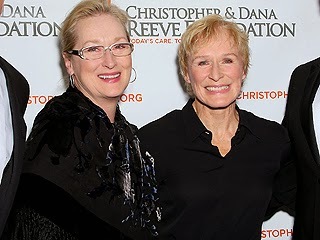 Evidently while filming The House of the Spirits with Glenn Close in 1993, the two came up with the idea of starring together in a film version of Schiller's play. They even approached Brit Richard Eyre to direct the project with a screenplay by Charles Wood. Filming was set to begin in late summer 1998. As so often happens, funding took a while to come together, and by the time it looked like it was going to happen, Meryl dropped out, being replaced by French actress Isabelle Huppert. The only reasoning behind Streep's departure that I could find was from a Guardian article which stated that Meryl's heart was no longer in the project. This obviously would've put the funding for the project in jeopardy, possibly resulting in its ultimate demise. Mary Stuart potentially could've provided both Streep and Close with fantastic roles. Although Mary of Scotts and Queen Elizabeth never actually met in real life, the play was a dramatic vehicle for the two main characters, as Elizabeth struggles with the prospect of having her cousin and rival for the throne executed for treason. Previous film depictions of these two women starring Katharine Hepburn/Florence Eldridge and Vanessa Redgrave/Glenda Jackson also had the pair meet and interact. For Meryl it would've been another nice buddy project, which we know she has an affinity for after her collaborations with Goldie Hawn and Diane Keaton. The character of Mary Stuart of course provides the opportunity for yet another accent. I believe Stuart grew up speaking French, so perhaps Meryl would've spoken English with a French-Scottish accent (whatever that would sound like). How nice it would've been to see Meryl's choices in the portrayal of a woman who's essentially on death row in the late 16th century. As previously mentioned, had Streep stuck with the project filming would've started in 1998, which means a likely late 1999 release. I wonder if Meryl still would've done Music of the Heart, which filmed around the same time. We know she spent a lot of time prior to that film learning and practicing the violin, a preparation that may not have been available had she done Stuart. If getting the financials in order took longer than expected, perhaps they simply could've bumped it back a year and film in 1999. We know she didn't have a ton going on around that time, and it would've given her a film release in 2000...and no doubt another year filled with Oscar buzz. I'm not sure how to feel about this film. On paper it sounds excellent and the history is interesting. 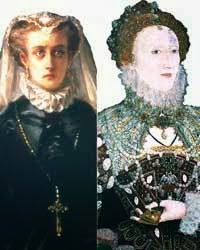 The two Queens are actually interred close together in Westminster Abbey in grand enclosures. I guess it seems Elizabeth would always be the more plum role (Mirren, Dench and Blanchett all had great success) but Mary is actually quite fascinating in her own right too. As for Music Of The Heart, I always thought this would have been much more suited to a TV film than a movie anyway so both in 1999 would have been great. Have you seen the film "Safe" with Julianna Moore, Jeff? I always thought this would have been an interesting alternative for Meryl than Before and After. That being said, I kinda like that Meryl had a gap from making movies and came back strong in 2002. I feel the industry had a chance to miss her and it felt like the beginning of a new era. I have not seen "Safe." I should check it out. I like the idea too of maybe having a break for a couple years for people to "miss" Meryl, and agree that it felt like a new era when she came back in 2002 with Adaptation and The Hours. In the play Mary Stuart it's actually Mary of Scots who is the bigger character I think. The opera by Donizetti is similar I think and although both are main characters, I don't think Elizabeth shows up until close to halfway through. Regardless I love that era and am totally including this in my reimagined filmography.